Ryukyu Kempo is a generic term for Ancient Okinawa Fist Way. The term was purposely used by Oyata Sensei to illustrate the commonalities between all Okinawan Karate. Prior to the founding of the different styles of Ryukyu Karatedo all of karate was merely separated by the three major styles: Naha-Te, Shuri-Te and Tomari-te. Naihanchi Shodan, Naihanchi Nidan and Naihanchi Sandan, Tomari Seisan, the five (5) Pinan kata, Passai, Kusanku and Niseishi. When he studied with Nakamura Sensei he learned and practiced Wanshu, Sanchin, Seiuchin, Chinto and Gojushiho. These additional kata were never implemented into the Zenkoku Ryukyu Kempo Karate Kobudo Rengo Kai. Oyata Sensei felt that the development of strong karate technique could be produced by focusing on fewer kata with a more in-depth study dedicated to acquiring body motion and posture and strict, deliberate hand movement. "In the past a single kata was studied for three years. A long time ago a particular master analyzed a single kata for over 10 years. Do not think you have mastered a kata and become proud of your success. Pride can lead to hurt your achievement in virtue and technique thus pride can be like a poison to the world." Karate in and of itself has many kata. It is not what kata you perform or practice but the way that you practice it using the core skills. The habits that are created by repetitious practice manifest the skills that you will bring to the battlefield. The importance of the kata is the effect that it creates. The term Ryukyu Kempo encompasses all of the three original styles of Tode. The 12 basic kata that Oyata Sensei used to develop his organization were to be considered to be generic karate without the prejudice or discrimination that eventually separated the original Tode. As different organizations began to branch out the division of karatedo created a change in original kata. Each individual Master taught the kata motion so it would emphasize his own concept of the kata meaning. This individualization created prejudice among the different groups of practitioners. 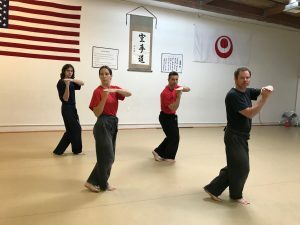 By revealing the kata in its most basic form (without prejudice) Oyata Sensei aspired to reveal the multitude of possible techniques that a single movement might be used for. A punch can be used as a block and a block can be used as a punch. A kick can be used as a block etc etc. etc... The bunkai or breaking down of kata motion can be applied in many different ways depending on the target and or the position of the opponent. 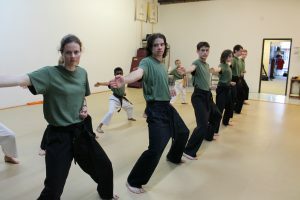 It makes the study of kata more complex as opposed to practicing a set way which greatly reduces the value of the kata. The 12 basic kata we teach in the Alliance curriculum are a step-by-step deliberate practice of exact and precise hand and foot positioning. It is a tool to remove any prejudice or preconceived idea of purpose. It is the ABC's of karate training. After the ABC's are mastered the next goal would be to learn how to put the letters in order, in various ways, to create words. After words are learned then and only then can you make sentences. After sentences, paragraphs then stories. The problem with karate today is that many people have learned their ABC's but have not yet learned to make words out of them. All Ryukyu kata use the same letters and the same alphabet. To learn and practice every kata would steal from the need to focus on the perfection of kata movement. The kuzushi kata we practice are a method of using the same alphabet in cursive handwriting as opposed to printing. The term kuzushi refers to off balance which means to move the body off balance to create a more fluid movement forward. The balance is quickly, confidently and deliberately regained by the mastering of the footwork. The kata we teach are a strict and dedicated version of the original kata. The kuzushi version is utilized to teach fluidity and timing in the application of advanced hand and foot motion. The kuzushi kata is only taught after the student masters the basic kata.